Talent, mental fortitude and weapons are only as good as a player’s movement in today’s modern game of tennis. The battle on the court is not only about hitting amazing shots but also about being able to reach amazing shots hit by the opponent. The modern day racket frame with its magical strings takes over as soon as soon the player is close enough to make contact with the ball. Federer: He would probably be the only one of this lot who would have thrived even in the era of wooden frames and super fast courts. He may not be as fast as Novak or Murray but his aggressive mindset infuses purpose to his movement and rarely do you see him out of balance while executing his strokes. Roger is a picture of poise, and grace which stem from perfect balance and a relaxed body while executing shots. I believe one of the most underrated aspect of Federer’s game is balance. His balance has allowed him to win Wimbledon titles in the era when the grass there was fast enough to be called grass. Balance in his case is as much a product of good movement and speed as it is of aggressive mindset. Federer always tries to dictate play which in turn requires him to plan the point at least three shots ahead and therefore his on court movement seems so purposeful and measured. Back in the days of smaller rackets and faster courts the winning strategy demanded aggressive play with a trip to the net and Roger would have been quite happy doing that. Nadal: Nadal’s movement is based so much on moving sideways at the base line that he rarely gets the opportunity to exploit his soft touch at the net. Nadal has always claimed that his style of play is to run and hit aggressively. It seems his definition of aggressive doesn’t quite match mine. I believe aggressive means to take the ball early to take time away from the opponent and constantly move forward to apply pressure, cut angles and finish the point as soon as possible. Yes Nadal can hit winners even when he is all stretched out of balance in a corner about 10 feet behind the baseline, but being able to accomplish such amazing feats is purely a function of superior speed and retrieving abilities and NOT aggressive movement or play. The combination of slower courts and modern day string technology I believe has benefited Nadal the most and if it wasn’t for injuries, Nadal would have had more slams that Roger by now. However, there is a price to pay for every style of play and movement. Federer pays that price with more unforced errors and Nadal with injuries. Djokovic: Novak is an exceptional mover and is willing to do whatever it takes to reach the ball. He knows that as long as he can even barely reach it, he can most certainly put it back into play. He doesn’t compromise reach for balance and poise and out of the four being discussed here Novak tends to be most out of balance when executing shots. Novak’s amazing stretches, lunges and gymnast like dynamic splits are legendary and help him reach just about any unreachable ball and then execute that perfect shot for a jaw dropping winner. This kind of shot execution from position of perfect imbalance was impossible in the past on much faster courts, and with 85 sq inch wooden frames strung with cow’s guts. Novak may have the ability to pull off an aggressive play but his mindset, and therefore his movement, compels him to prolong points and not end them. He even attempts to serve and volley and make net approaches but lacks the soft touch of Nadal and Murray at the net and doesn’t really commits to that tactic substantially enough. Those shots that Novak has hit from positions of gross imbalance while lunging, stretching and executing perfect splits and contortions have all had their cumulative impact on his body and now bother him as niggling and even some serious injuries. Now that he is 29, he will get to enjoy more of that happy zone where he can binge watch Game Of Thrones, and spend quality time with family. Murray: This man is so fast that he can probably qualify to run alongside Usain Bolt in the 100 meters finals at the Olympics. However, his movement is perhaps the most purposeless of the four being dissected here. Murray, in my opinion happens to be as comfortable moving forward as he is sideways and can play quite aggressively when he absolutely makes up his mind to do so. However, so far he has used his amazing athleticism mostly to display his astounding speed rather than dictate points. If Murray could bring some purpose to his movement he could surely win a few more slams but father time is catching up fast and after 29 the best known way to tackle time is by taking it away from opponents. I believe Murray can reinvent his game but will his mindset allow him to reshape his movement? In part III I’ll try to tackle the future of our gladiators after 30 and their mindsets, and thereafter the intangibles category which I believe could bring about the most tangible changes in their games. Nice article. Nadal, Djokovic, and Murray are all pushers. I say this with the utmost respect, because they’ve reached levels of greatness and in many cases their records against Federer, arguable GOAT, are pretty good, good, or even excellent. Physically, they are all tanks. You could make a defensible case that they are actually better than Fed. But I cheer for Federer, and I prefer him to any of those three, because of his aggressive and spectacular play style. It’s just far more interesting to watch (for me, anyway). Unlike the other 3, he rarely stumbles or looks awkward on the court. It might be inconsequential to the results, but his efficiency and grace on the court are simply unmatched; nobody is even close. And now we’re at that stage where it becomes obvious what a great benefit it is to play this way. Much remains to be seen, but it seems like the physical toll that the bodies of Rafa, Djoker, and Murray are subjected might hinder their tennis in their twilight years. I mean that Novak Djokovic´s backhand is his great weapon. Novak wins 60% of long rallies against Rafa too for example. I mean that Novak Djokovic is in this article underprized. His talent is underprized there. Nobody never reached his playing brillance, his textbook backhand is the great weapon too. Novak Djokovic is the most consistent baseliner of the world in extra long rallies. Murray is more talented than Nole or Nadal? Are you crazy? Also you do not understand meaning “Agressive Play” in the Tennis. In 21-century Agrresive doesn’t mean Serve and Volley. 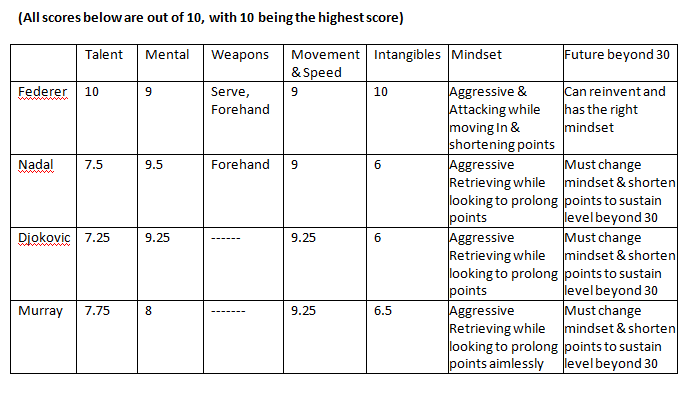 Agressive means powerful, good directed and topspinned shots in almost any situation. Early contact as a measure of agressiveness nowadays is not a criterion: speed is too high to win something from early contact, but you suffer from the inconsistency as a result you playing too flat, too soft, too defenstive, too weak. Check Federer’s shots with early contact, half them or more is or slice or underpowered.